Spray Insecticide with high effectiveness and immediate and residual action. Power because of the POWERFUL JET UP TO 6 METRES thanks to a special "JET" VALVE. A real destroyer of wasp and hornet nests, even quite large ones, which are at a considerable distance. It also kills insects that return to the nest after the treatment, suppresses larvae, eggs and pupa, leading to the total collapse of the treated nest. Emptying time about 1 minute. ALSO USED BY THE FIRE SERVICE! Notes: The special "JET" VALVE, which makes the jet long and powerful, allows you to work in complete safety, even in extreme conditions. As a result it is also possible to destroy nests located in places that are difficult to reach. Shake thoroughly before use. 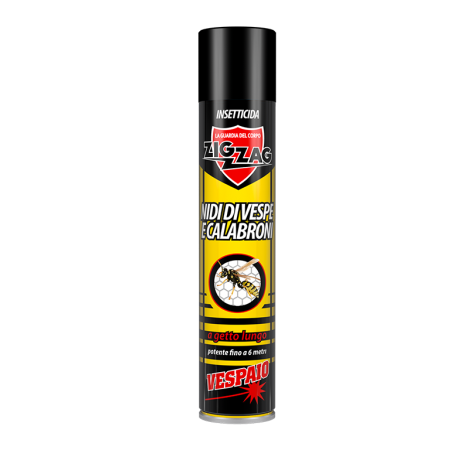 Spray from a safe distance of at least 4 metres, at brief intervals, directing the jet directly on the nests of the wasps or other insects (spiders, bumble bees, bed bugs ...). The ideal is to act in early morning or late evening when the wasps are drowsy inside the nest.